MOOSIC, PA (January 31, 2018) - The Scranton/Wilkes-Barre RailRiders, Triple-A affiliate of the New York Yankees, are pleased to announce that Bobby Mitchell will serve as the team's manager in 2018. Mitchell will be joined in the dugout by pitching coach Tommy Phelps, hitting coach Phil Plantier, bullpen coach Doug Davis and defensive coach Travis Chapman. Athletic trainer Darren London and strength and conditioning coach Brad Hyde also return to the RailRiders for the upcoming season. Mitchell, 62, spent the last two seasons managing the Trenton Thunder, the Yankees Double-A affiliate in the Eastern League. He led the Thunder to 87 wins in 2016 and a 92-48 record in 2017, pacing Trenton to the Eastern League Championship Series and earning Manager of the Year honors. He was selected in the seventh round of the 1977 draft by the Los Angeles Dodgers out of the University of Southern California. Mitchell played professionally for 10 seasons within the Dodgers, Minnesota Twins, Detroit Tigers and Toronto Blue Jays systems, including portions of four years at the Major League level. His coaching career began in 1992 in the Montreal Expos organization and he has managed professionally for ten seasons, including three seasons for Salt Lake in the Pacific Coast League from 2008 through 2010. Mitchell holds a career record of 609-508. "From top to bottom, the Yankees have a lot of young talent moving up the ladder," Mitchell said. "The whole system is packed with prospects and that is a really good thing. Honestly, the most satisfying part of the job is seeing guys make that jump to the big leagues. Knowing our guys are driven and are going to work hard for that goal makes us all excited to get this season going." Phelps has served as the RailRiders pitching coach for each of the last two seasons. He was originally selected in the eighth round of the 1992 First-Year Player Draft out of T.R. Robinson High School in Tampa and made his Major League debut for the Florida Marlins in 2003. A former pitcher, he appeared in 75 games at the Major League level and 313 in the minors. 2018 will be tenth season as a Minor League pitching coach for the Yankees, having spent time with Trenton (2009-2014) and Tampa (2015) before joining Scranton/Wilkes-Barre. Phelps has led the RailRiders pitching staff to the International League's best earned run average and the second-most strikeouts during each of the last two seasons. Plantier joins the Yankees organization this year. The former outfielder was initially drafted by the Boston Red Sox in 1987 and made his big league debut in 1990 at age 21. Plantier played portions of eight seasons in the Majors, spending time with the Red Sox, Padres, Astros, A's and Cardinals. Since retiring, he has spent time as both a manager, hitting coach and hitting coordinator in the Seattle Mariners farm system and managed Lake Elsinore in 2011. From 2012 through 2014, Plantier was the hitting coach for the San Diego Padres. Davis is a Bloomsburg native and is entering his second season within the Yankees organization. A Central Columbia High School graduate, Davis was selected in the ninth round of the 1984 First-Year Player Draft out of NC State and played professionally for 12 years. Davis began his coaching career in 1996, won a New York-Penn League title with Pittsfield in 1997, a South Atlantic League crown with Columbia in 1998 and was on the staff of the Florida Marlins when they won the World Series in 2003. His managerial mark is 515-484, including two seasons with Syracuse. Davis also spent seven seasons as the Minor League Field Coordinator for the Toronto Blue Jays prior to joining the New York Yankees organization last year. Chapman enters his sixth season as a coach or manager in the Yankees system, having spent 2017 at the helm of the organization's Dominican Summer League team. He was drafted by Philadelphia in 2000 from Mississippi State, played 134 games for the Red Barons in 2003 and made his Major League debut that season. Prior to his stint with the DSL club last season, Chapman spent two years as the defensive coach for the Class-A Charleston RiverDogs in the South Atlantic League. London returns for his 26th straight season as the athletic trainer of the Yankees' Triple-A affiliate and 2018 marks his 30th year in the New York Yankees organization. He was the International League's Trainer of the Year in both 2006 and 2012. Hyde was the RailRiders Strength and Conditioning Coach last season. He graduated from Arkansas State in 2009 with a B.S. in exercise science and begin working for the Yankees in 2014. 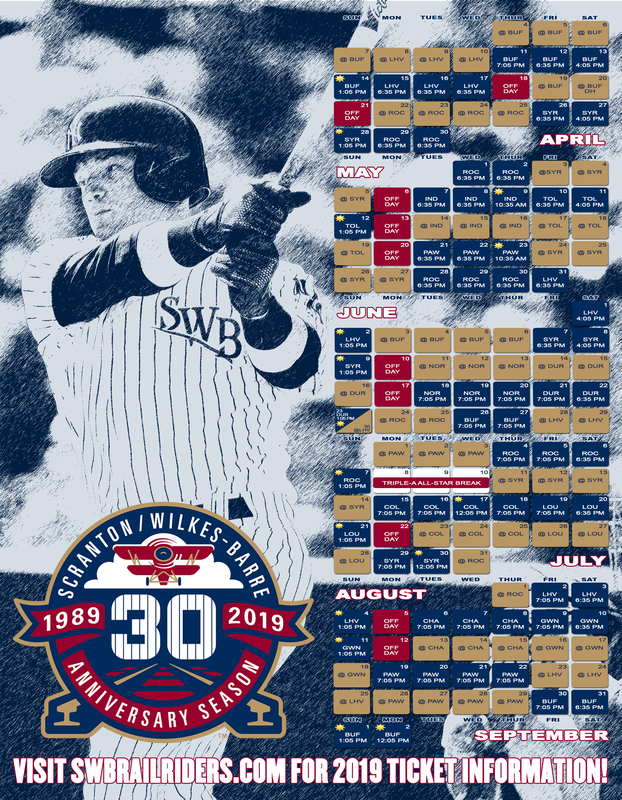 "The Yankees are committed to developing their talented pipeline of players that runs through Scranton/Wilkes-Barre," stated Josh Olerud, RailRiders Team President and General Manager. "Bobby Mitchell has proven time and again that he knows how to advance players along in their careers while also playing winning baseball. We are excited to add the reigning Eastern League Manager of the Year to our family as we watch the RailRiders make another run at the Governors' Cup in 2018." The RailRiders former manager, Al Pedrique, was hired by the Oakland A's during the off-season and will serve as their first base coach in 2018. P.J. Pilittere was the RailRiders hitting coach in 2017 and has been promoted to the New York Yankees field staff. He is one of their two hitting coaches under new manager Aaron Boone. Please direct all media and interview requests to Adam Marco, the Director of Broadcasting and Media Relations for the Scranton/Wilkes-Barre RailRiders. He can be reached at 570-558-4637 or via email at amarco@swbrailriders.com. The 2018 season begins at PNC Field on April 6 against the Syracuse Chiefs.